ENSENADA, Mexico— Preparing to start the New Year in a dynamic way, tickets are still available for next Saturday’s (Jan. 13) annual SCORE World Desert Championship Awards Night. SCORE International will celebrate at the popular San Diego Air & Space Museum at the historic Balboa Park. The colorful museum is located in the heart of San Diego. At the San Diego Air & Space Museum, nearly 500 SCORE racers, family, friends, fans, crews, sponsors and media will bask in the Southern California sunshine as the SCORE Awards Night will honor the history and fame of the name which is the standard for desert racing worldwide while celebrating the four-race 2017 SCORE World Desert Championship. This will be the first time that the annual SCORE Awards Night will be held at the San Diego Air & Space Museum and the ninth time the historic evening will be held in Southern California since 2000, when it was held at Joe’s Garage automotive museum in Tustin, Calif. It will also be the eighth consecutive year in SoCal for the popular event. 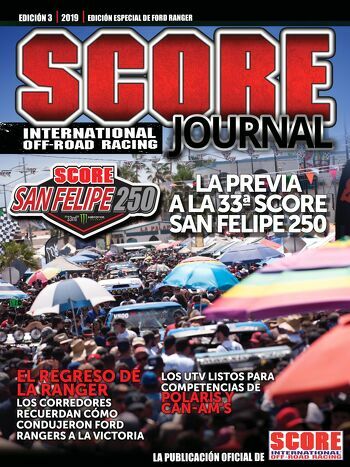 In 2017 SCORE International celebrated its 44th year as the World’s Foremost Desert Racing Organization. 2017 SCORE Awards Night Tickets here or by calling the Audreonna Cuarez, SCORE Registration and Membership Director at 775.852.8907. Payment may also be made by check sent to the SCORE International Reno, Nevada, USA office. Arrangements through Ms. Cuarez may also be made to reserve tables of eight or 10 guests. A pre-awards reception will start the festivities at 6 p.m., followed by the dinner at 7 p.m. and presentations starting at 7:30 p.m. Guests at the event will be allowed to enter the museum at 5:30 p.m. to view the numerous historical displays at the popular facility prior to the start of the reception at 6 p.m. In addition to the special SCORE Achievement Awards and the Pro and Sportsman classes that qualified racers for class season championships along with five overall point champions who will be honored. Another highlight of the evening will be the presentation of the annual SCORE Off-Roadsman of the Year Awards. Individuals as well as manufacturers and organizations are honored through 11 distinct SCORE Off-Roadsman of the Year Awards, whose winners are decided by several thousand SCORE fans through online voting including the entire SCORE membership of more than 2,500. Among the awards to be presented are SCORE Rookie of the year, SCORE Contingency Company of the year, SCORE Pit Support Team of the year, SCORE Mechanic of the year and SCORE Person of the year. Voting was held on the SCORE website, ending at midnight, Jan. 4. Another element of the diverse program for the evening will be the presentation of the 2017 SCORE Milestone Awards. As it has for 32 years, the coveted SCORE Milestone Awards are presented to those racers who finish every required mile of the 2017 SCORE World Desert Championship. A total of 31 racers completed all 2,057.97 required miles in the four-race 2017 SCORE World Desert Championship. The evening will include a colorful video/photographic tribute to the 2017 SCORE World Desert Championship produced by BCII TV, SCORE Live and GetSomePhoto. Primary emcee for the evening will be SCORE live announcer Rat Sult. The four-race 2017 SCORE World Desert Championship in Baja California, Mexico along with the SEMA SCORE Baja 1000 Experience and the SCORE Baja 1000 Qualifying in Las Vegas have all been airing on El Rey Network in the United States. International distribution is by way of syndication. The season-ending 50th BFGoodrich Tires SCORE Baja 1000 will have a two-hour show produced while the other race shows were each one-hour telecasts. The race show will air at 2 p.m. PT on Sunday, Jan. 14, 2018.